In our daily lives many of us use social media and mobile phones for communication with our friends, family, classmates, and fellow workers. We use Facebook, Twitter, Tumblr, Instagram, Snapchat, Pinterest, YouTube; or we text, chat and use apps on our mobile phones. It can be difficult (and even socially awkward or impossible!) to disconnect—if we even want to be offline! Much of the social media we use are free and convenient, but are they really, truly ‘free’? Why is it that we receive ads in our Gmail and Facebook that appear to be things that we would be interested in buying? How do these sites know I enjoy yoga, like to eat chocolate, and am a fan of horror films? Teachers and parents are constantly telling youth to be careful about the information they put online, but do we really need to be careful? It’s difficult to say for sure but it can also be scary to think that the government is spying on us all the time, and that any information we put online is not protected by privacy laws. It’s frustrating to be a highly desirable group for advertisers to target, yet have no say over how our personal information is used. Does the government even care what we say and think as youth? This teaching kit is aimed towards teachers, mentors, or other professionals who engage with youth 14 years of age plus, who are seeking to engage them to consider privacy issues. 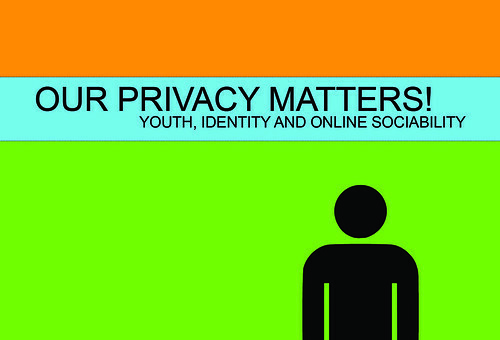 This teaching kit features a documentary film titled Our Privacy Matters! Youth, Identity, and Online Sociability as well as remix and hacking activities to enable youth to express themselves about privacy issues. Our Privacy Matters! is a documentary about youth, identity and online sociability created and produced by Giuliana Cucinelli and Leslie Regan Shade. This film explores privacy issues and includes the voices of Canadian youth, educators, and scholars. It is designed to introduce youth to issues related to privacy, social media and youth but also to encourage youth to get involved in expressing their thoughts and concerns about online privacy. In this teaching kit, we provide the documentary and learning activities to be used in a classroom or out-of-school setting with youth ages 14+. This teaching kit is intended to augment the resources available at the Our Privacy Matters! website. Using Mozilla Foundation's webmaker tools, youth will be given the opportunity to explore, hack, and remix web content related to privacy themes. Paper Privacy Collage: the opening activity will use sticky notes and group collaging to allow youth to express their ideas about privacy. 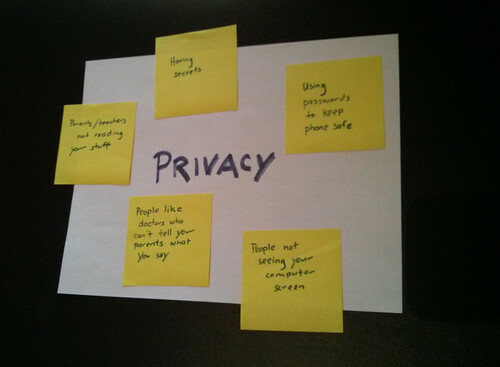 Here are some examples of what a privacy collage might look like. The first is individual, the second is collaborative. X-Ray Goggles will allow youth to inspect the basic HTML code elements that make up a web page, and adjust these codes to make their own changes on a site that houses their personal information. This tool provides a space for both learning and commentary. Popcorn Maker is a web-based video remixer that allows users to use, break down, extend, and remix video, audio, and photographs from all over the internet. Take a look here to see how content from Our Privacy Matters! can be remixed. Popcorn Remixes of Our Privacy Matters! Youth utilized a variety of audio-visual assets including images, text or their own original content to alter Our Privacy Matters!